Homestead Products, parent company of the SuperPost, is committed to producing reasonably priced, high quality products, while remaining environmentally responsible. The SuperPost fence sleeve is made out of Poly Vinyl Chloride (PVC) which is comprised of 60% chlorine, derived from naturally occurring common salt. The balance of PVC is crude oil and natural gas. PVC is one of the most energy-efficient manufacturing materials currently available and it is 100% recyclable. Very little fossil fuel is used in the manufacturing of PVC, which means almost no green house emissions are released into the atmosphere during the manufacturing process. Using the SuperPost system extends the life of a wood post almost indefinitely. This translates to decreased lumber use and tree harvesting. And unlike wood post products that have been treated with chemicals to slow down erosion and pest infestation, the SuperPost does not leach anything into the soil or water-table. Sooner than later, every wood post that is set solely into concrete will need to be replaced. The task of removing a post and concrete pier is extremely difficult and wasteful. 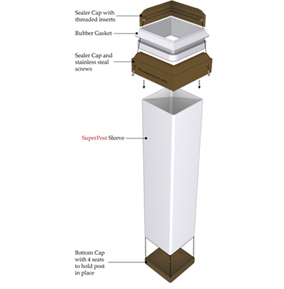 With the SuperPost system of removable post protectors, a solution is provided that will eliminate the need to ever remove and replace your concrete footings.